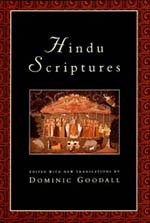 The scriptures revered by Hindus are enormously varied, and R. C. Zaehner's anthology has long been considered invaluable for its breadth and diversity. Now Dominic Goodall expands Zaehner's work with three fresh translations, including one work that appears for the first time in English. Spanning more than two thousand years, the range of selections in this book include arcane hymns of the ancient Aryans, prescriptions governing every aspect of the daily life of the orthodox, and sensual poetry. Dominic Goodall was educated at Ampleforth College and at Pembroke College, Oxford. He is now attached to the Institute Français de Pondichèry in South India and is working on the manuscript collection there. Note: Macrons, underdots, tildes, and other diacritical marks have been omitted in this web rendition of the table of contents. The book itself does include all necessary diacritical marks.